As the largest autonomous region in China, Xinjiang boasts substantial contingencies of different ethnic groups and is well-known for its Central Asian flair. Its cities are dominated by the Uyghur ethnic minority, as well as several other Muslim groups such as the Hui and Dongxiang people, meaning the food is predominantly halal and there is a marked lack of pork compared to other parts of China. 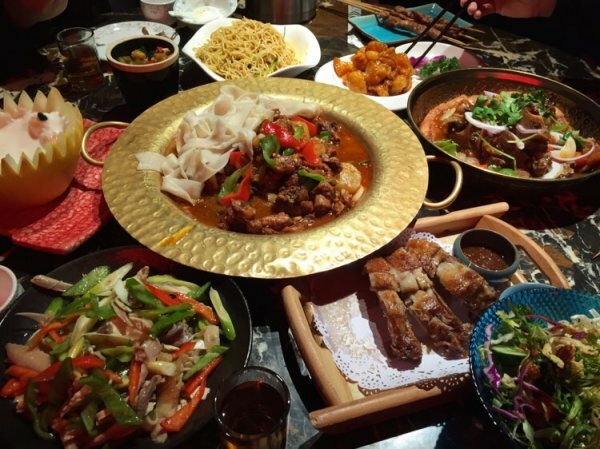 In many ways, the cuisine in Xinjiang differs from the rest of the country and is distinctly non-Chinese. Roasted mutton, thickly fragrant spices, and sugary sweet desserts take centre stage when it comes to its signature dishes. Since many of the cities within Xinjiang were once oasis towns along the Silk Road, they felt the influence of other ethnic groups most profoundly and have cherry-picked features of their cuisine, incorporating techniques and flavours from the Tibetans, Mongolians, Persians, Turkish, and numerous other nationalities. These have all come together to form a stunning mosaic of Chinese, Central Asian, and Middle Eastern qualities. Liberal use of seasonings like cumin, chilli powder, cinnamon, garlic, and saffron sets Xinjiang cuisine apart from other styles throughout China. So you might want to keep a glass of milk handy, because we’re heading into spicy territory! “Dapanji” literally means “Big Plate Chicken”, so it goes without saying what the signature ingredient of this dish is! It rose to popularity in Xinjiang during the 1990s, although its origins aren’t entirely clear. 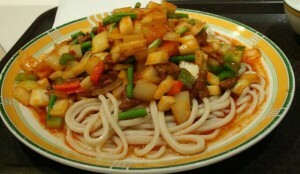 Several ethnic groups, including the Uyghur and Hui people, lay claim to its conception but popular belief states that it was invented in Shawan County of northern Xinjiang by an immigrant from Sichuan province, who liberally mixed hot chilli peppers into the dish in an attempt to recreate his home cuisine. After all, there’s nothing quite like a home-cooked meal! The dish itself consists primarily of bite-sized pieces of chicken (usually with the bone in) and potatoes, which have been sautéed in a medley of spices and coarsely chopped vegetables before being simmered in broth. The required ingredients are numerous, and include bell peppers, onions, garlic, ginger, chilli peppers, ground cumin, star anise, ground Sichuan peppers, cooking oil, and occasionally soy sauce and beer. Imagine how long the chef’s shopping list must be! The result is a hearty, savoury, and mildly spicy casserole-like dish that is bursting with flavour. It is typically served with hand-pulled noodles or naan bread and is the ideal comfort food when you’re feeling peckish! 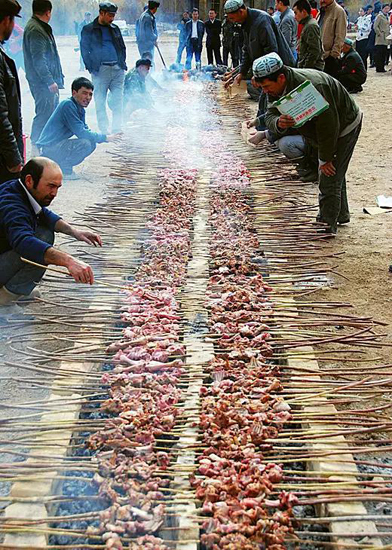 This distinctly Uyghur dish is classified as a type of kebab. Small, sumptuous slices of lamb and tiny chunks of lamb fat are seasoned with chilli powder, salt, black pepper, and cumin before being skewered and roasted over a charcoal fire. As the meat is gently roasted, it is further sprinkled with a fragrant mixture of cumin seeds, dried red pepper flakes, salt, black pepper, and sesame. Be careful not to get too close while they’re cooking, or the spicy powder might bring on a bout of sneezing! Lamb is the meat of choice, but nowadays popular variations include chicken, beef, seafood, steamed buns, and even insects. Crunchy spiders and salty scorpions may be a little too adventurous for the average palate, but the juicy strips of lamb are sure to get your mouth watering. Each kebab is made to order and is usually served with a soft naan bread, making it the perfect lunchtime treat or just a cheeky snack on the go. 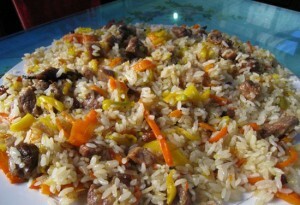 Alternately named polo, polu, or simply Uyghur pilaf, this is a type of pilaf rice that originated from the Uyghur ethnic minority and really attests to the influence Central Asia has had on Xinjiang’s cuisine. The dish is made by first frying chopped carrots, onions, and mutton (or chicken) in oil until the vegetables are perfectly caramelised and the mutton is thoroughly cooked. Rice and water are then added, and the whole dish is steamed until the rice is cooked through and gives off a tantalising aroma. Sometimes raisins and dried apricots are scattered on top to give the dish an extra sugary tang. The locally grown yellow carrots provide its characteristic sweetness, while the rice is deliciously buttery and the tender mutton adds a pleasant smack of saltiness. It takes a notoriously long time to cook, so most vendors will only serve it at lunchtime. 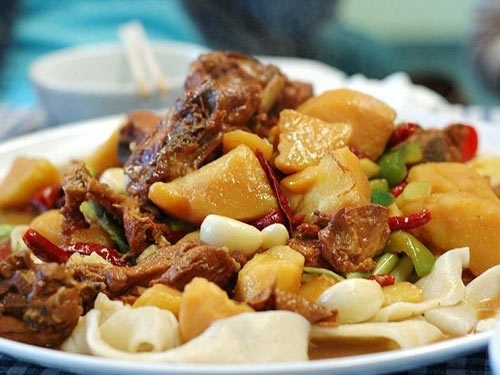 This dish is so important to the region’s culture that there are even whole restaurants in Xinjiang dedicated to perfecting it. And, after you’ve tried it, we’re sure you’ll never say rice is too plain again! Like the Lanzhou Beef Noodles or lamian of Gansu province, the main ingredient of laghman or lengmen is hand-pulled noodles that are undeniably scrumptious. The dough is made from a simple mixture of flour, water, and salt, and then stretched into noodles by hand in a laboriously long and skilful process. From the outset, they have a distinctly different flavour from those found in other parts of China since they are made from wheat flour rather than rice flour. A heaping helping of noodles are boiled until they are perfectly soft, and then topped with a rustic vegetable ragout typically made from bell peppers, eggplant, onions, chilli peppers, garlic, tomato, and any other vegetable that happens to be in season. This rich topping is made by simmering the vegetables in a pot full of meat stock and, if you’re lucky, may include a few meaty titbits. The thick texture of the noodles is perfectly complemented by this hearty sauce, making for a meal that is both filling and comforting.